Soon after estrogen peaks, the hormone LH suddenly surges, triggering the release of the ovum (the egg). The ovum only survives for a day. Afterwards, the ovarian follicle that released the ovum turns into a special, temporary body called the corpus luteum. The corpus luteum produces a surge of progesterone. The surge of progesterone causes an increase in the woman's waking (basal) temperature. If the woman did not conceive, the corpus luteum atrophies. This is because the corpus luteum suppresses the production of FSH and LH, which it needs to sustain itself. The corpus luteum is effectively killing itself. With the corpus luteum no longer working, the level of progesterone drops. This triggers menstruation. The woman might notice that her basal temperature drops a day or two before she gets her period (otherwise, it will drop during her period). If the woman conceived, the development of the fertilized egg produces the hormone human chorionic gonadotropin (hCG). This is the hormone detected by pregnancy tests. 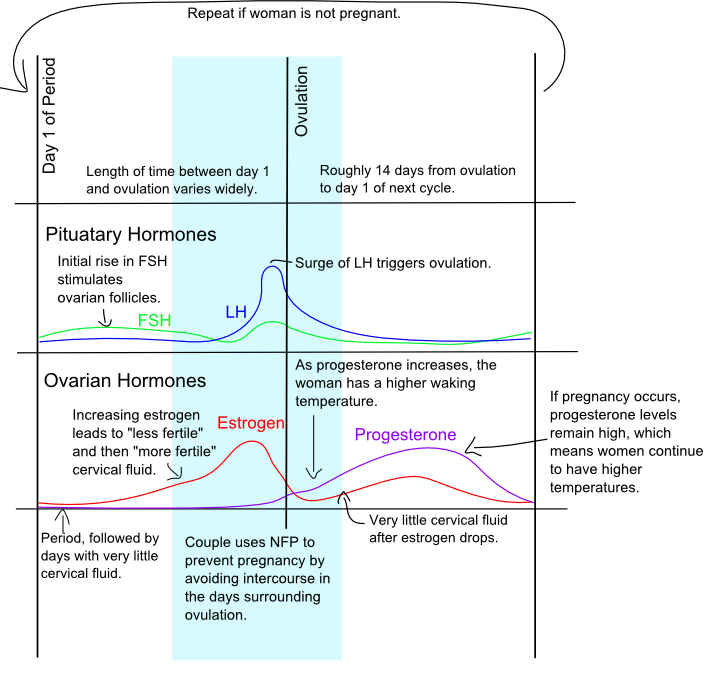 The hormone hCG looks similar to LH, which allows the corpus luteum to continue producing progesterone throughout pregnancy (instead of atrophying). As a result, the woman would observe continued high temperatures. While the length of the woman's cycle can vary widely, the length of time between ovulation and the start of the next period is much more consistent. The reason cycles vary in length is that the length of time prior to ovulation varies. From ovulation to the next cycles takes on average 14 days. Even among different women, this time frame is very consistent. If the woman noticed 18 consecutive days of high temperatures after ovulation (and no period), it would be highly likely she was pregnant. A study of "adult" dancers found that dancers earned about $15/hour more in tips during in the fertile time around ovulation (estrus) compared to the portion of the cycle after the fertile window (the luteal phase). Another study of women found that women are more likely to wear reds or pinks around ovulation than at other times of the month.